Bahrain has been subject to the unrest and protests sweeping the Arab world since the revolution in Tunisia. The demonstrations in the capital Manama started on February 14 2011, and escalated on the 17th with a deadly attack by security forces on unarmed civilians at Pearl Roundabout. 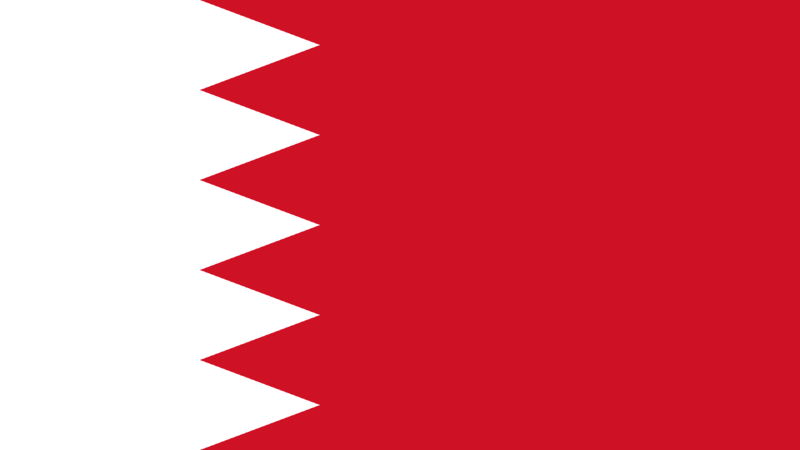 The horoscope for Bahrain is for the granting of independence from the UK on August 15, 1971 . I cannot find the time of the signing of the treaty so will use the noon chart. As our colleague Gabriella Mittelman pointed out to me in another post, Israel Spiritual War, the horoscope for Bahrain has Pluto being heavily aspected. With pluto at 28 Vrigo, it is being opposed by rebellious Uranus, and is square to the transiting Lunar Nodes and the December 2010 Lunar Eclipse. 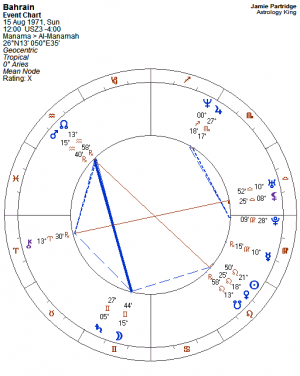 Pluto in the mundane chart rules political power and dictators. The people are demanding a democracy with fair representation. At the moment, Bahrain has a constitutional monarchy, and 80% of its members are from the royal family. 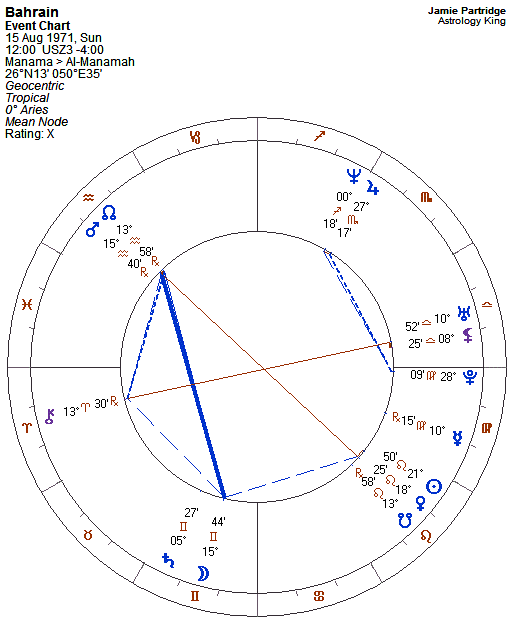 Using the precession correction value of 33′, Uranus was exactly opposite Pluto on February 16. The massacre at Pearl Roundabout occurred the following day with the Sun square the Bahrain Jupiter, and Mercury opposite her Sun. The Bahrani Sun is on a star in the head of the Lion called Ras Elased Bore, “heartless and cruel” . 2. Fixed Stars and Judicial Astrology, George Noonan, 1990, p.32. I’m quite alarmed with this statement Ahmed. Are you trying to make an appeal regarding this? Which specific hospitals are you talking about? As a temporary relief, look for your nearest Red Cross or Red Crescent office. Based on your statements, I notice that you are aware of what’s going on around you through online access. Try searching for the nearest KSA Red Crescent office number based near the Bahrain bridge border. Just tell them that you or a group of people you know needs medical attention and be specific about which hospitals are preventing you access if any. The intent here is to reach the nearest medical help as per your needs, and not to fuel more of the discord that’s going on in Bahrain. I would just like to point out something, based on an economic point of view, that Bahrain is currently thriving on the affluence of its neighboring countries as key stategic hub between KSA and GCC. Why on earth would you want to upset that? I can tell that you are young and there’s a lot of aggressive drive to actualize your potentials. Go to school and get a degree. If financing is a problem, there are a lot of scholarship funds set up by the Arab countries for its young, driven and talented individuals for studies in excellent Arab universities such as the American University in Lebanon, Cairo and Sharjah and there are still more in the UK and Europe. Search and you will be surprised with the options that your own government have set up for its youth. I’m Southeast Asian and most of us had to endure hunger pangs just to save money to pay for our tuitions. We waited for doled out books from charities in the US and Europe. On an ordinary day, we shared books with our classmates. Some kids in impoverished Asian countries even go to school barefoot, walking a few kilometers to get to the only school in the village. And one of these barefooted poor children became the president of the Philippines. Hard to believe but let your own dreams as you nurture them now, guide you to become the leader of your time, through peacefully diplomatic means. Rest assured, an educated Arab with his heart in the right place is one of the most cultured man there is. I know of one wealthy billionaire Arab prince who looks relaxed on pictures but who works 24/7, and even harder than any of his staff does. And he doesn’t complain about it. He earned his worth through hard work and education. Wake up. There’s no more Jihad. That’s a bygone era. What you and your group has are abundance of potentials to become the leaders of the future but you don’t get there by toppling any leader who’s there to look after your needs. You will get there through hard work. Bahrain golf pearl the country with a million palms it’s all gone thanks to Arab dictator, the word Bahrain resamples torture massacre death violation and the list go on. I love my country but I never called Hamid my king, some so called Religious scholars stated the king is your guardian and to disobey is forbidden….king? A king is just a title. What the….happen? even I don’t know it’s simply a miss, before all hell broke loss the position held a press conflict stated accepting the dialog with princes Salman next morning around 6am we got our answer a Peninsula Shield to Purification Bahrain from opposition in their own words (some were wondering why we don’t trust them) I hate that we saw it coming but we didn’t even dream they would go as far as calling sectarian Military to annihilation unarmed people. Calling help to kill your own people it’s a phenomenal but we got the msg sell your soul to the west and you are judgment proof, is this the world we want to live in? A world that runs by fear and deception but whose running it….can you see where it’s heading a disaster. Peace ain’t that the dream…why the….is it still a dream you see things; and you say, ‘Why?’ But I dream things that never were; and I say, ‘Why not? This is for dreamers out there if you can dream then you have a heart. I gotta tell you before The revolution my heart only broke twice now I lost count, I can’t do this in my own so for the first time in my life I say this word (please) just help me make them open the hospitals that’s all I am asking for even sticking a picture on a wall makes a deferent…..can you help me? Saying my peace here bcz they arrest Bloggers and by Saturday night might get lucky my last word will be freedom, hope I can try 3DS before that XD once a gamer always a gamer. #Bahrain government are beyond pissed that we are still peaceful and didn’t retaliate from the start of the revelation sure we closed a road after military attacked us twice at pearl roundabout and to make them fear attacking again we started a play a stranger come to and say military is at the Blocked so we march from pearl roundabout with sticks it worked they got scared, scared enough to bring a Stigma shield, It’s like a time bomb here just waiting for an order to let us fight back even though we don’t have a single gun. (Malcolm X: some times you have to pick the gun up to put the gun down, you get your freedom by letting your enemy know that you’ll do anything to get it then you’ll get it its the only way to get it). #Kuwait refused sending military to butcher unarmed people, instead they tried sending a medic team just to heal and save life’s when they arrived to Bahrain they were denied entering and ordered to go back when they arrived Kuwait they told them my bad you can come back to Bahrain but spend the night at Saudi a 12hour car drive and in the morning they told them go back Kuwait…..talk about cat and mice. #Do you know that both UAE and KSA who entered Bahrain to save the king had there princes in Arranged marriage with the Bahrain prince….talk about saving marriage. # Only in Bahrain the native citizens are actually gallous from Naturalized….I dream and the Naturalized take, I dream and the Naturalized take that’s enough I will stop dreaming. # Jihad is simply spreading god words so in this so called free world why is there still people killing each other and say its jihad? # This have been a perfect opportunity to find out who’s simply Neutral in delivering news so stay away from bbc and cnn it’s sad that the only English channel I can advise is CBS, Do i even need say google is goverment controlled ? # When the revolution started they told us we are the same as England stop trying to make a change we asked a journalist at one of the March he told us we elect our Prime Minister and if this many people march asking her to step down she would step down. #why stopped the Strike…. they brought foreign military what make you think they wouldn’t bring workers? Some might be going to work (by bus) but make no mistake we are at a strike. #the human right organization….more like human joke this is the perfect chance make an example and a warning to any idiot who kill his own people, is it wrong to ask for a king that would protect the protester instead of killing them. #End of the world is an act of god….not human, Oh no the end of the world is coming…..idiots stop waiting for the end and just enjoy now they remind me of my little bro when we go out he thinks too much at when we going back that he never enjoy the ride. # I don’t get it why is there Medals for killing each other? Or why is a life of a child worth more than the life of an Elderly, what the…..is minor casualty. #finally you got bored with films about the Arab terrorists while not a single bad movie about Jews talk about forcing concept, some wondering is USA tax payer funding Terrorism. Hello welcome to the real world. #so many Objections to Guantanamo but nobody knows we have over 10 Guantanamo in Bahrain and anyone who object the king is a terrorist. # Imagine a world represented in one piece I believe the west are the navy and Shichibukai are the dictators finally pirates are the people that doesn’t set 10 hour/day behind a screen. # Did you know that Yemen leader had tried making himself permet king called his people terrorists and now trying to negotiate when he will step down just …..Off. # Yes we said down down Hamid in our march we said it to make give in not a reason to kill us. This reminds me can you all just spread (beb beb bebeb) in the car horn, it resembles down down Hamid spread it around the world because it’s forbidden in Bahrain XD. #In Quran ((If you stretch your hand to kill me I won’t stretch my hands to you to kill you, I fear Allah, Lord of the Worlds)) they are killing us here and we are Muslim what make you think they would spare you and why the whole world had to hear holy Quran was burned that guy has been nagging so much do you mind just shave him bald. # Only in Saudi when an earth quake or 9/11 Occurs they say you deserve it bcz you are Infidel its god worth upon you and woman are still forbidden from driving in Saudi for god sake they will shade windows and promise not to open them or get out of the car just let them be. # israel has been in philistine for the last 60 years and just from there action you gotta admit Hitler had a point: I could have annihilated all the Jews, but I left some of them to let you know why I was annihilating them, But the problem isn’t the jews it’s the idiots in charge they keep saying there will be one more war than israel will be jews heaven!……every problem can be solved without a bloodshed except the North/South korea conflict. #I just loved the 2 statement Iran made: the closer you are to israel the farther you are to Iran, It’s an insult to call telling you stop killing unarmed people interfering.